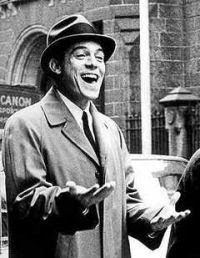 Naked City star Paul Burke gone at 83. Paul Burke, who shot to stardom as Detective Adam Flint in the groundbreaking police drama Naked City has died from leukemia and non-Hodgkins lymphoma at his home in Palm Springs, California, September 13th, 2009. Born in New Orleans in 1926, Burke enjoyed a four decade career in TV and film. Burke made his way to Hollywood at the age of 19, where he studied acting at the Pasadena Playhouse. In his early days in Hollywood, Burke managed to get small roles in features, but his real success would be in television in the 1950's and 60's. In 1960 he was cast in Naked City, a police series filmed in New York. Other series include Twelve O'Clock High, The Adventures of Superman, Highway Patrol, Dragnet and many others. Feature films include The Thomas Crown Affair and Valley of the Dolls. Remaining active in television, Burke joined the cast of Dynasty in the 1980s. In addition to his wife Lyn, Burke is survived by his three children from his first marriage.